A very popular bulb at the nursery, that is easy to grow in a well drained, rich soil in a sunny position or in light shade. They are quite versatile plants and can be naturalised in grass, rough pasture or light woodland. Flowering is from late May to mid July, on stiff stems from 25cm - 70cm tall. Tall erect sturdy spikes up to 60cm, covered with wisteria-blue flowers in June/July. Tall erect sturdy spikes up to 60cm, covered with light blue flowers in June/July. 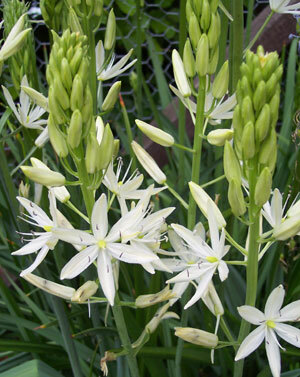 A popular plant with large racemes of beautiful, creamy-white flowers. A NEW hybrid with large racemes of sky-blue flowers on stiff stems up to 60cm tall. 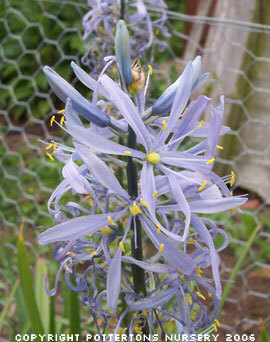 Large racemes of dark blue flowers on stems up to 70cm tall. Large racemes, densely covered stems of semi-double creamy flowers, over a long period, June to July. Bright violet-blue flowers and yellow stamens on 25cm tall. Good for naturalising. Variegated foliage contrasts against the bright violet-blue flowers, 25cm tall.